The Mr X Kid ! The Legacy of a Stretch Super Hero! Can you see the uncanny resembelence? Of course you do,thats because this is in fact the the Mr X Kid,and the Man.You have already seen the Kid on the Hulk Box. 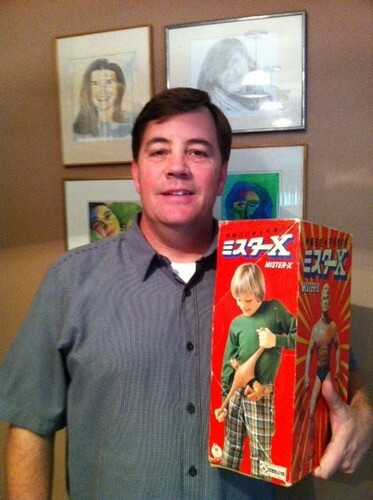 Now meet the newest Stretch Super Hero,Eric,The Mr X Kid! Thats right,I was recently contacted by the Kid on the Mr X Box,the Japan version of Stretch Armstrong produced by tsukuda way back in the 1970s.Eric will forever be one of Stretch Armstrong Worlds Stretch Superheroes makeing even the Stretch Incredible Hulk green with envy.You will see below the pictures of him as a kid on the box and a recent picture of him now as a man.Read on my stretchy friends and learn more about this great new development on Stretch Armstrong World! Below is the email I receieved from the Mr X kid better known as Mr Eric Schunk.Thanks Eric for shareing this great moment of your life with all the collectors out there and Stretch Armstrong World. Tony "Stretch King"
My dad was stationed at Yakota Air Force Base in Japan from 1976-79. 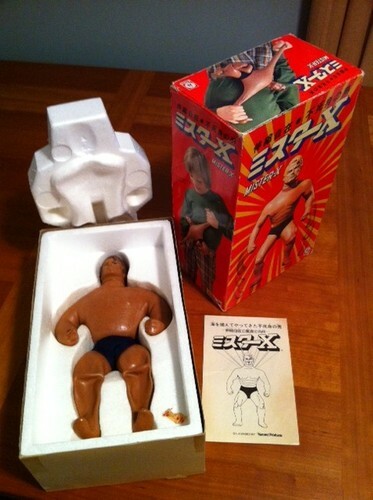 My parents had friends whose children modeled for Japanese products and, with my blond hair, I had several opportunities - but none bigger than the Japanese version of Stretch Armstrong... Mr. X! I was 9 years old and vividly remember that, during the photo shoot, two men had to pull Strech's arms, hand me the figure, and jump out of the way so they could quickly take the picture before his arms recoiled too far. After several takes, and my sore arms, the photographer was happy. My mom was told that an artist would draw my likeness for the image in the instruction booklet - which turned out pretty well. It was such a thrill to see my picture on boxes in the local toy stores! And, while I played a bit with the Stretch I got, I saved the doll, box and booklet. I just wish I would have known your tips for preserving the doll a couple decades ago. Thanks for preserving an exciting part of so many kid's (including this big kid's) childhood. Below Eric Shunk 9 years old has been forever preserved in time as the Mr X Kid. This is Erics personal Mr X Figure with his youthfull image proudly displayed on the box.What an amazing feeling that must be,dont you think?